NIANTIC, Conn. -- A woman who admitted drowning her newborn in a toilet a decade ago, when she was a teenager, has had her 18-year prison sentence commuted. The state Board of Pardons and Paroles on Wednesday ordered that Panna Krom, of Danbury, be released Sept. 30. Krom said she killed the baby girl in 2006 because she feared the reaction of her family, from whom she had hidden her pregnancy. She pleaded guilty to manslaughter in 2008. “I now know how irresponsible actions can result in dire consequences, a notion that my 17-year-old mentality could not accept,” Krom told the board. Vicki Hutchinson, Krom’s lawyer, argued that her sentence was much harsher than those given to others in similar circumstances, which she said have averaged five months. “The sentence imposed in Panna Krom’s case is 12 times the longest other sentence imposed for similarly situated girls,” she wrote in her application to the board. Hutchinson also noted that Krom, now 26, has served more than half her sentence, earned a high school diploma and completed six semesters of college work with high grades. 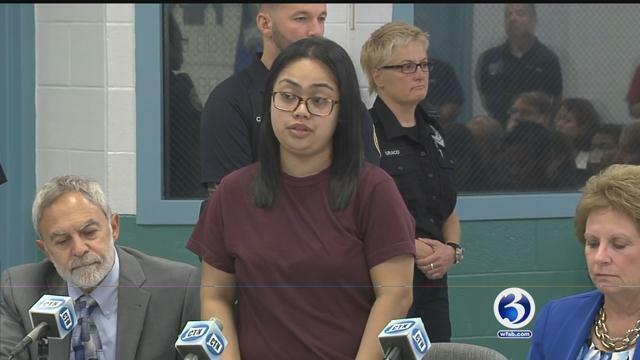 Krom said that when she drowned her baby, she was not aware of Connecticut’s Safe Haven law, which allows a mother to anonymously drop off a newborn at a hospital with no legal repercussions. She said she plans to work to educate other young women about that law. Danbury State’s Attorney Stephen J. Sedensky III opposed the clemency. He noted that Krom’s lawyers had agreed to the plea deal and that Krom, who was originally charged with murder, would have been eligible for parole in January 2019.